Auricle or Pinna: The concave, ovoid form of the ear. Helix: The rim of the auricle. Anti-helix: The curved prominent part which is parallel to the helix. Scapha: The narrow and curved depression which lies between the helix and anti-helix. Concha: The deep cavity which is rimmed by the anti-helix. Lobule: The ear lobe which is made up of areolar and adipose tissues. Get a complete medical check-up so that the surgeon can have a good idea of your general health status. Consult the doctor if you are on any medication and whether these should be stopped for a while. Avoid tobacco and alcohol for two weeks before the surgery as it increases the risk of surgical complications. If the procedure is being carried out under general anesthesia, a consultation with the anesthetist can be held. Follow all orders given by your doctor without fail. The surgery normally takes one to two hours. In case of trauma to the ear or any congenital defect that involves reconstructing an ear, cartilage grafting might be necessary. In such cases, cartilage is taken from the patient’s rib cage. This is then sculpted to form the auricle or the pinna. In case the ear lobe is also damaged or missing, the surgeon will conduct a follow up surgery within a couple of months to create an earlobe. This is used for patients with several congenital ear deformities or for those who have insufficient cartilage for grafting. In this technique, tissue is moved from behind the ear rim in order to repair the defective front. Sutures between the scapha and concha are tied with enough tension to ensure that the anti-helical fold is well defined. The procedure sets back the helical rim and the scapha. The cartilage is made to undergo abrasion. This causes the cartilage to bend and it can then be reshaped. 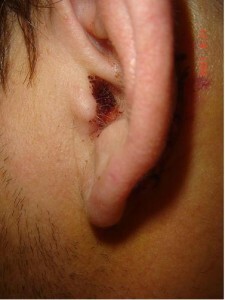 An incision is made at the back of the ear, along the natural folds. The exposed cartilage is then reshaped or excised as required. Stitches are used to retain the new shape of the ear. In case of defects in the conchal area, the cartilage is removed from the posterior wall of the concha. Earlobe correction is often described as the most difficult part of otoplasty surgery. One way of correcting earlobe defects is by suturing the helical cartilage to the concha. Yet another procedure that is used to excise the skin and put sutures between the ear lobe tissues and neck tissues. In the Gosian surgical technique, the skin surface on the earlobe is cut open and the conchal area is taken in to pull the ear lobe towards the head. An incision is made on the back of the external ear. The cartilage is loosened and excess skin and cartilage are removed. The concha is re-positioned to lie close to the head and sutures are used to reshape the anti-helix fold. The ear is then pinned back and sutures are used to make it lie flat against the head. Post-surgery, you will have to sport a voluminous head dressing for a few days. This is done to retain the new shape as well as to encourage quick healing. You will have to spend some time in the recovery room. Once the hospital staff is sure that all your vital signs are normal and there are no complications, you will be allowed to return home. Once the bandages are removed, you will have to use an elasticized head band for a few weeks to keep your ears in position. You must take care to learn about otoplasty risks before undergoing the surgery. The effects of the surgery are permanent and reversal is only rarely reported. Of course, complications during ear surgery recovery can be avoided only by taking proper precautionary measures both before and after otoplasty. This entry was posted in Otoplasty and tagged ear reconstruction surgery, ear surgery, ear surgery otoplasty, otoplasty surgery by Zipheal Editorial Staff. Bookmark the permalink.